Penang is a great place for an afternoon's shopping and there are a multitude of shops around the island, selling everything from local Malaysian handicrafts and "batik" (wax-dyed fabric) to inexpensive electrical goods, pewter ornaments and antiques. Most shops on Penang remain open until as late as 22:00, and so there is plenty of time to grab for gifts after a day on the beach. Although the shopping scene doesn't really compare to that within Kuala Lumpur, most will find that Penang is home to more than enough shops, particularly around Georgetown. 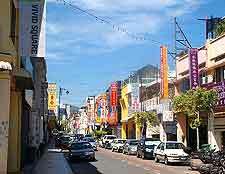 In particular, the Jalan Penang is Georgetown's number one shopping street and a good place to come for a choice of souvenirs, along with other stretches, such as the Lebuhrhaya Cintra, the Lebuhrhaya Kimberley and the Lebuhrhaya Pantai. 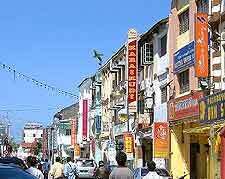 When shopping on Penang, do try your hand at bargaining, which can get good results in most outlets, except for large department stores. This is particularly the case at the Chowraster Bazaar market hall on the Jalan Penang, while the lively night bazaar on the Batu Feringgi is not to be missed. For something a little more modern, then close by and on the Jalan Penang, the western-style shopping centres of both Komtar and Prangin Mall will be of interest, being filled with literally hundreds of chain stores, boutiques and eateries. Also on the Jalan Penang is the Kompleks Tun Abdul Razak (KOMTAR), a huge shopping complex also comprising restaurants, office space, entertainment and city views. 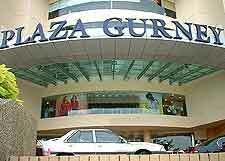 Other popular shopping malls on Penang include the very classy Gurney Plaza on the seafront promenade known as the Gurney Drive. 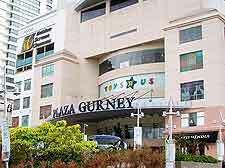 Also vying for your attention is the enormous Queensbay Mall within the modern Queensbay development, the Sunshine Square Mall in the city of Bayan Lepas, and the Sunway Carnival Mall, which lies within the heart of the Seberang Jaya area.